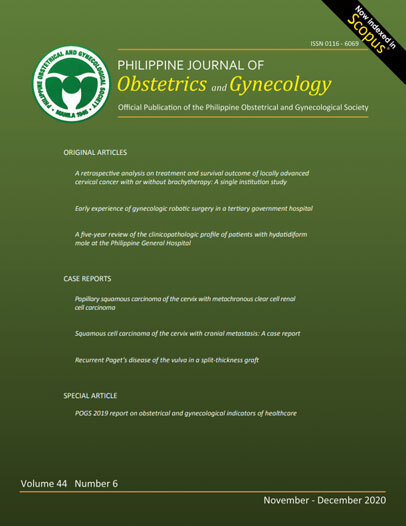 The Philippine Journal of Obtetrics and Gynecology (PJOG) is the official publication of the Philippine Obstetrical and Gynecological Society, Inc. (POGS). It is a peer-reviewed journal that covers all aspects in obstetrics and gynecology and features original research papers and case reports, as well as correspondences. The journal is published quarterly and sent by courier mail to all POGS members in good standing. When sent by mail, the hard copy of the manuscript should be accompanied by a a soft copy in a USB or CD wrapped in protective material to avoid damage. The author should keep a copy of all materials submitted as they will not be returned to the author. The manuscript should not have been previously published and is not under consideration for publication by another journal. Should the author decide to submit a PJOG-published article to another publisher, or present the paper (orally or in poster) in a scientific forum, he should secure the written permission of the Editor-in-Chief. If the manuscript had been presented prior to its submission, the author should state the forum, date and venue of such presentation. All authors named in the manuscript should have significantly contributed to its preparation and writing. All authors should agree on the contents of the manuscript and are responsible for its validity and data authenticity. The authors are also responsible for securing permission for use of any copyrighted text or illustration. At the outset, they should disclose any financial interest and all sources of support, including pharmaceutical and industry support. A manuscript submitted to PJOG is screened for publication by the Editorial Board. The paper will undergo a blind peer review by two evaluators who are content experts on the subject matter of the maunscript. The Editorial Board has the prerogative to deny publication of any manuscript and their decision is final. Review articles include systematic critical assessments of the medical literature on specific, relevant and timely topics in Obstetrics and Gynecology. The manuscript (excluding the abstract and references) should not exceed 2500 words and 20 references. written with no more than 2500 words (excluding the abstract and references) and 10 references. than 5 references may be cited. If the letter refers to a previous article, it should be sent within 3 months from publication of the index article. Only manuscripts witten in the English laguage with American English spelling will be accepted. Accepted manuscripts will be edited according to journal style. When major revisions are needed, the manuscript, with accompanying comments from the reviewer/s, will be returned back to the author/s for corrections. The use of Word and its tools such as Spelling and Grammar Check, Word Count and Thesaurus are encouraged. The use of a Plagiarism Detection Software is encouraged. a maximum of 150 words. For indexing, 3-5 key words should be written alphabetically below the abstract. It is recommended that the key words be taken from the US National Library of Medicine’s Medical Subject Headings (MeSH) browser list (http://www.nlm.nih.gov/mesh/meshhome.html). The manuscript of a research articile should be divided into the following sections: Introduction, Objectives, Materials and Methods, Results, Discussion, Conclusion, Limitations, Recommedations, Acknowledgements, References and Appendix. Generally, the introduction should be concise and focused on the specific subject of the manuscript. The objectives section should state the general and specific objectives of the study. The results section should contain only findings borne by the study. The discussion attempts to explain the findings of the study based on current knowledge. It should not be a literature review. for medical substances, unless the use of a specific brand name is important. In the latter situation, the pharma- ceutical interest should be declared. When acronyms or abbreviations are used, the acronym enclosed in parenthesis should initially follow the entire phrase or group of words. Abbreviations should be spelled out no matter how common they are. In the text, the reference should be cited using super-script Arabic numerals placed after the sentence and in the order of their appearance. (e.g. Cruz J dl, 2008, unpublished data). For abbreviating names of Journals, use the Index Medicus style or access the list at http://www.ncbi.nlm.nih.gov/nlmcatalog/journals. Cunningham FG, Gant NF, Leveno KJ, Gilstrap III LC, Hauth JC and Wenstrom KD (eds): Williams Obstetrics, 21st ed. USA: McGraw-Hiall, 2001. Mishell DR. Amenorrhea. In: Droegemuller W, Herst AL, Mishell DR, Stencheber MA (eds): Comprehensive Gynecology. St. Louis: CV Mosby Co., 1987: 15. Tables and figures are placed in the appendix. Do not embed tables and figures within the body of the manuscript. Group tables together and all figures together. There should be no more than six graphics, including tables, figures, photos and slides per manuscript. Create tables using the table creating and editing feature of your word processing software (eg, Word, WordPerfect). Do not use Excel or comparable spreadsheet programs. Cite tables consecutively in the text, and number them in that order. They should be self-explanatory and should supplement, rather than duplicate, the material in the text. The tables should have concise but comprehensive legend. Column headings should be short with units in parenthesis, or statistical headings well-defined. Footnote symbols should be used (see Word, Insert, References, Footnote) except for the asterisk* which should be reserved for P values (i.e. 0.03*). When presenting photograph of subjects or specimen, any identifying mark should be cropped, or an eye bar should be used to prevent the subject from being recognized. Use arrows to emphasize subtle pictures. When submitting electronic or scanned photographs, resolution must be atleast 300 dpi. Markings, such as arrows, that are used to direct the attention of readers must be embedded in the files. The source of funding or grants should be acknowledged. As earlier stated, when brand names of drugs are used, the author should declare pharmaceutical interest, his industrial links and affiliations. Other contributing personnel or institutions should also be acknowledged. Acknowledgement of writing inspirations is not allowed.